Last Friday we had lighting strike a pine tree in the front yard. I am sure the tree is dead. It has streak marks from the top to the bottom and out into the ground about 4 feet. Scared me and Patch near to death. I just had the ac fixed that morning after the repairman had been out for 3 days. The ac is ok as is most every thing else. I lost one cordless phone, the ans machine and the modem for the computer. Replaced the roadrunner modem and cord, but apparently the problem is the internal modem. Computer works, just cant get on the Internet with it. SOO, I am using a 2001 laptop that has been sitting for 3 years. It works, but slow. The cd part doesnt work, so I cant add pictures or programs to it. but I can talk to the outside world a little. I will post a picture when I get the desk top back from the computer shop. In the mean time I went to the Mountains for 4 days. It was wonderful. COOL the high was 78. We slept with the windows open. Wonderful trip. Monday,We went to Johnsonville Tn shopping to Somewhere Sewing. They have about 8000 bolts, I think. A great shop. 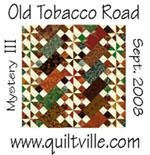 Then to Jonesboro to shop at Tennesee Quilts. also a great shop. And we found a Wal-Mart with fabric in Elizabethton. Found lots for $2/yard. If you live there check it out. Wed. We met another friend in Burnsville NC and shopped at Needle me This. 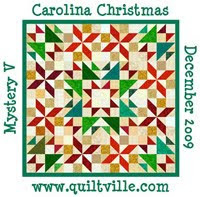 It was Just in the McCalls 10 favorite quilt shops. A nice shop. FUN day. We had to detour around work on the train tracks several times, so was quite an adventure. 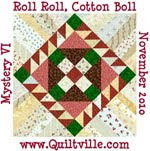 Back home to clean up my sewing room so I can get back to work quilting.